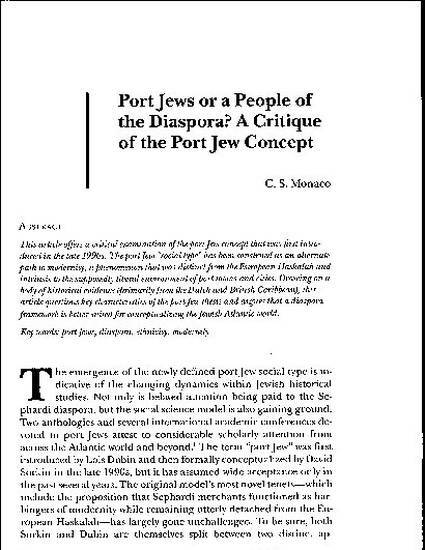 This article offers a critical examination of the port Jew concept that was first introduced in the late 1990s. The port Jew "social type" has been construed as an alternate path to modernity, a phenomenon that was distinct from the European Haskalah and intrinsic to the supposedly liberal environment of port towns and cities. Drawing on a body of historical evidence (primarily from the Dutch and British Caribbean), this article questions key characteristics of the port Jew thesis and argues that a diaspora framework is better suited for conceptualizing the Jewish Atlantic world.